We wanted to have one final fun filled day before my daughter started her first day of school. One of our favorite things to do as a family is to go bowling. So, we headed out to the newest place to bowl, FatCats. Check out our trip! Mommy Moments with Abby's review of FatCats in Gilbert, Arizona. We pulled into the parking lot and the kids were completely excited! I was glad the parking lot was spacious, I hate it when I have to spend more time finding a spot then I will spend getting my shoes on to bowl. Once inside the kids were all lite up, their wasn't just a bowling alley to explore! 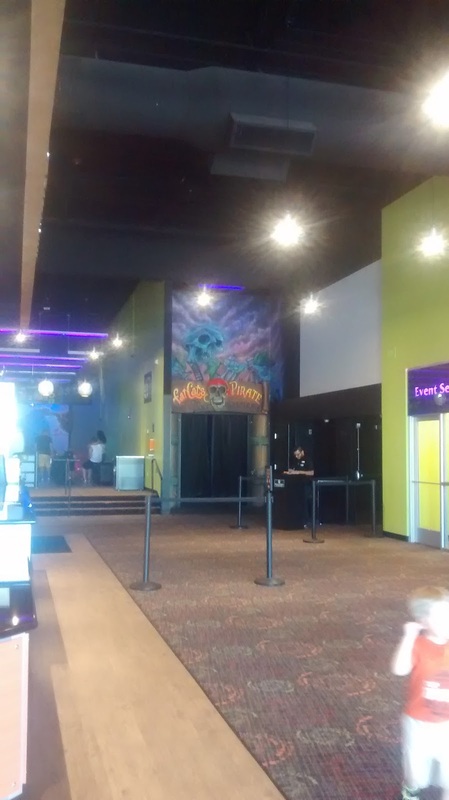 They also had a movie theater, a dine and recline, an arcade, a mini putt area, and then a little food area! Focusing everyone back on the task we had come to explore we got our lane, and shoes and then up to the bowling area. My husband loved the large screen TV playing sports. My kids loved the black light lit up bowling lanes and painted background. I loved the large couches for everyone to sit on in between their turns and that the kid ramps were stored neatly between the couches. No searching for one or someone to dig one up for me!!! SCORE!! Then we got our bowl on!! The kids had a blast not just bowling, but bowl dancing as the latest hits played keeping the energy pumping for our little family. We blew threw an entire hour without even realizing it until the 5 minute warning came up! I don't think we looked at our scores at all we were having so much fun just working on our different forms and mad bowling skills! We all got in on the fun, even the baby took a few turns! We turned in our shoes and then checked out the arcade. It wasn't overwhelmingly big, but had something for everyone. 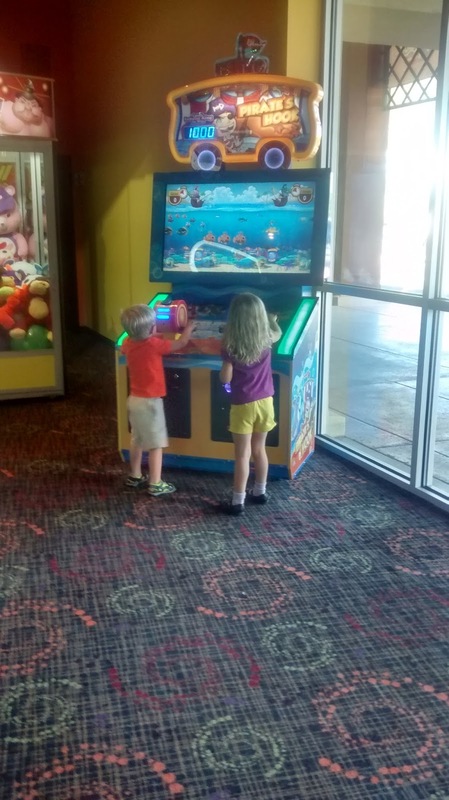 My kids had a blast checking out the games and trying to win tickets. The prices to play weren't that bad either, a few were even around $0.75 and then up to about $2.00. This meant the kids could be entertained for longer without killing my wallet which makes me smile! The hubby and I were checking out the dine and recline for possible date nights in the future. I also had the great thought for a fun first no school day of a movie and then maybe some bowling or arcade games! The plans are already being laid for a repeat visit to this place. First on our list to come back and try, the mini putt! I loved mini putt as a kid and here in AZ their just aren't a lot of places to mini putt, especially ones that are nicely air conditioned and indoors! We had a blast at FatCats and found it to be a great family getaway on these super hot days! We laughed a lot on our little trip. FatCats made for the perfect FunDay before school starts! This was a great place for the kids to get some fun in, let some steam off, and paint smiles across their faces! They also have Thunder Alley which we did not check out on our trip, we went during the day. Basically, Every night FatCats turns the lights down and pumps up the entertainment! TA-DA, Thunder Alley! Will have to check that one out at a later date. Check out this coupon for your FatCat trip! Buy One Game of Glow Golf get one game free - Bring a friend into FatCats & get a free game of glow golf. With this coupon you will get a Buy One Get One free. Valid Monday-Thursday until 8pm and not valid on holidays. Click on FATCATS for your coupon.